Rivers in summer hold little attraction to the Ol’ Duck Hunter. There’s no reason then to slip behind a screen of rose, cradling a fowling piece, swaddled in white. 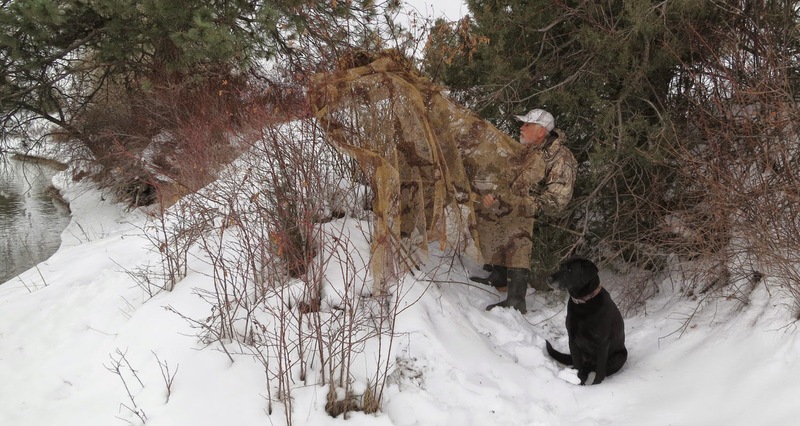 No reason to wait, lab at your side, while ducks float down the river’s center, a few leaving the current, feeding just out of range in the eddy near your decoys, attracting other mallards that set their wings, drop and land, still too far. The only hunter visible from the hide wears white, head and tail. In its sights, a lone duck, floating close to the snow-covered ice lining the river’s banks. The eagle swoops, talons ready as the duck dives. Again. Again. The duck tires. Another swoop, another dive, and the duck floats on. Waterfowl regulations are many, but the Ol’ Duck Hunter follows two additional rules: take nothing but drakes, and shoot until the duck is dead. The hens are the future, the drakes expendable and ever so attractive in their refracted green headgear. 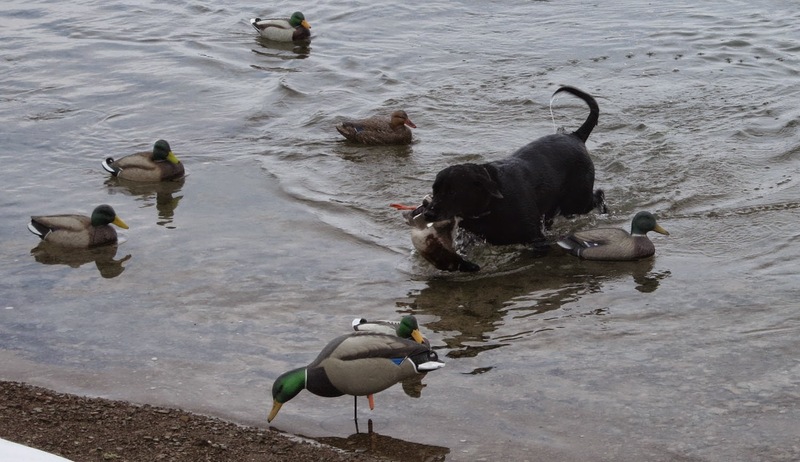 If a duck drops, but hits the water swimming, it’s best to use another shell so the duck lies dead in the eddy rather than watch the chase, Jazz’s head bobbing in the strong, cold current as desire pulls him farther and farther downstream. 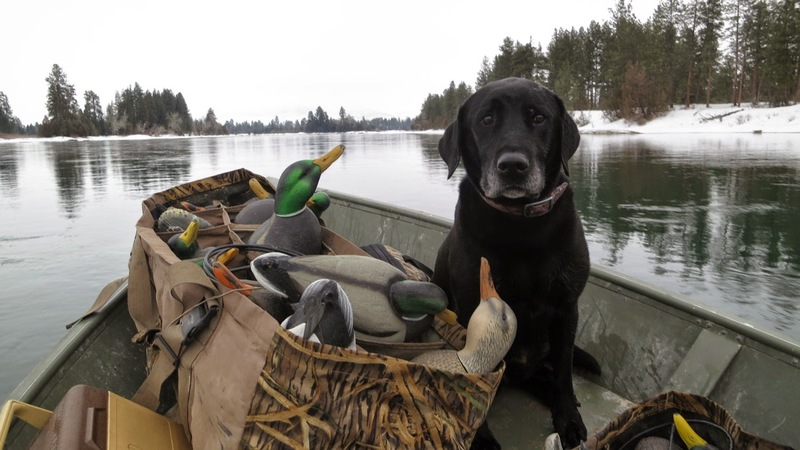 Jazz is a North Dakota farm dog, let free to roam and so starved for companionship that he jumped into the cab of the Ol’ Duck Hunter’s pickup during a years-ago pheasant hunt. The farmer had no desire to keep Jazz, timid, shy, never make a hunting dog. So, after the proper arrangements, Jazz rode back to Montana with the Ol’ Duck Hunter. When introduced to the duck boat, Jazz got in, but at the outboard’s first cough, leapt for safety. After a few aborted launches and a morning’s deliberate cruise, Jazz was fine with the tools of the trade. The duck boat, welded wide-bottomed utility, parts the river and lifts ducks on either side that hang briefly in the cold air like summer’s mosquitoes. Above them, trumpeter swans, seven, white, necks far before them, wings beating deliberately against the gray morning’s mist. Once Jazz, the Ol’ Duck Hunter, and decoys are delivered, the duck boat becomes a billboard of sorts, warning, “Hunters Nearby.” The Ol’ Duck Hunter moors the boat as far from the hide as possible but not so far that he can’t reach it in time if a duck floats downstream out of Jazz’s reach. Throughout the day, most ducks regard the billboard’s warning, staying high and midriver as they fly over. A few fail to see or heed the billboard, passing within range of the Ol’ Duck Hunter’s 20 gauge. They fall, Jazz swims and they’re laid to rest inside the snowy hide. 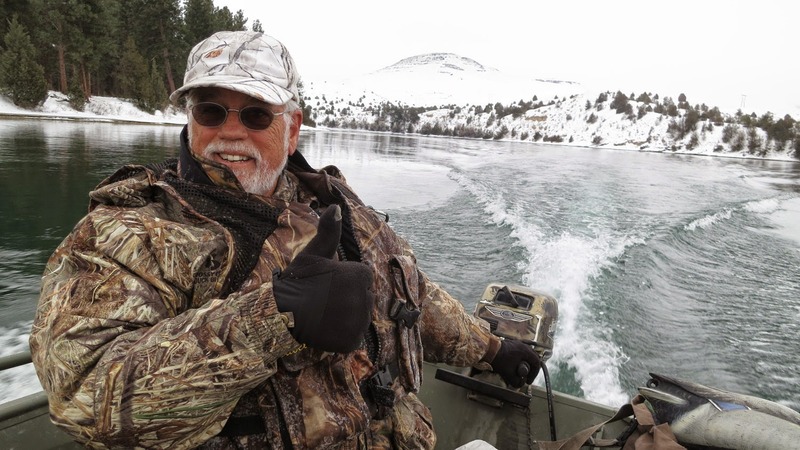 Hunt concluded, the pickup relies on all four wheels to climb snowy tracks carved into the hillside, the Ol’ Duck Hunter at the wheel, Jazz resting on a blanket behind the seat, the duck boat being tugged behind. At the pavement, a field of standing corn. Calligraphies of ducks are written across the sky—hundreds, thousands, thousands more—streaming from the river, wheeling in large circles before dropping to the winter table set for them. Season ending a few days hence, mallard bounty in the pickup bed, promise of future seasons circling above the corn.